Abstract base class for a string-based user interface. 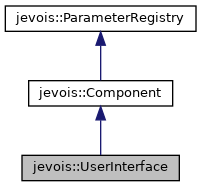 Users interact with the JeVois hardware by issuing text commands and receiving text answers. UserInterface is an abstract base class for such communications, with derived classes Serial (on the platform hardware, using hardware serial and serial-over-usb) or StdioInterface (on host, using user inputs and outputs in the terminal). See Command-line interface user guide for the user documentation of the command-line interface. Definition at line 32 of file UserInterface.H. Enum for the interface type. Definition at line 59 of file UserInterface.H. Definition at line 21 of file UserInterface.C. Definition at line 26 of file UserInterface.C. str is untouched if user input is not yet complete (RETURN not yet pressed). The RETURN (end of line) marker is not copied into str, only the characters received up to the end of line marker. 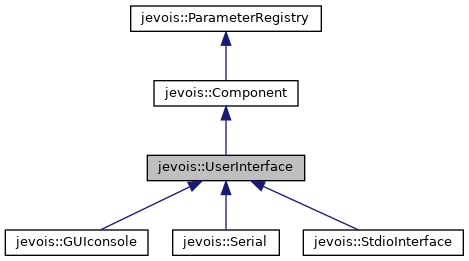 Implemented in jevois::Serial, and jevois::StdioInterface. Derived classes must implement this and return their interface type. No line terminator should be included in the string, writeString() will add one. In the Serial derived class, this will be using the line termination convention of serial::linestyle to support different styles (CR, CRLF, LF, etc). Write a string, with a prefix prepended. Definition at line 30 of file UserInterface.C.